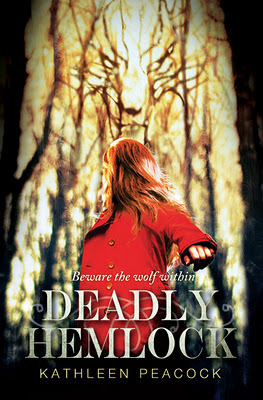 YA writer, geek and self-professed probably fodder in the event of a zombie apocalypse, Kathleen Peacock, wonderfully gave Australian bloggers a sneak peak at her Australian/UK cover for her novel Deadly Hemlock. DH will be released in July. The red coat. Apart from the contrast of colours being gorgeous, and the fact it ensures it’s not a clone of other covers, the link to Little Red Riding Hood is so much fun. The Wolf in the branches. OMGoodness! How awesome is it. The colour of the sky – it’s so iridescent and eye catching. The fact we can’t see Mac’s face – it allows us imagine her ourselves. I love that. The author name – why don’t I have a cool surname like Peacock. If you want to find out more about this cover came into being you can read an interview with cover designer extraordinaire Nick Stearn who worked on the artwork, here. Thanks so much Kathleen for sharing this with us and I look forward to seeing Deadly Hemlock on the shelves and reading it.